Artificial plants are easy to care for and ideal for those who prefer a low-maintenance approach- There is no need to worry about watering our plants! No matter where you place them, our artificial plants will brighten up any room up. Desflora have a beautiful collection of plants to choose from, small plants and succulents in pots through to leafy plants and towering trees. 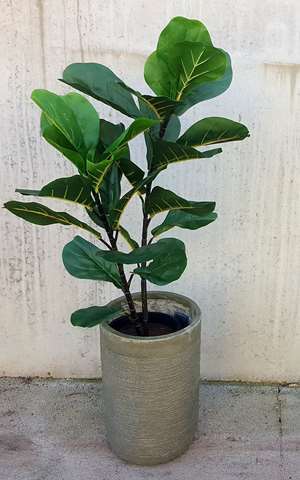 Our selection in artificial plants includes many leaf types in assorted colours, sizes and shapes. We manufacture trees with real wood branches from 40 cm to 220 cm tall. Yucca trees 3 to 15 heads, ficus trees green or variegated leaves, camellia trees with or without flowers. Artificial Plants with flowers include bird of paradise, canna lily, azaleas, cyclamen and spathiphyllum to name a few. Choose from our selection of exotic ferns, artificial succulents, fake palms and more to fashion a space that truly stands out. We have Hanging bushes in baskets either leafy or with flowers including spider plant, Boston fern, geranium, ivy, wisteria along with other plants. We are always searching for new plants and greenery, if we dont have what your after, chances are we can order it in for you. Whether you are looking for a small plant or wanting plants for a large commercial project we look forward to working with you and helping with your selection. Visit our showroom today, There are lots of artificial plants and trees on display, our friendly staff will be happy to provide you with any assistance you may need. Desflora proudly supplies quality lifelike artificial plants and trees to the public and wholesale sector. Most of our artificial plants and trees are available from our showroom at Hallam in Melbourne. If you email us with your requirements we can reply with pricing and availability. Alternatively We do deliver and install when required.